Pit vipers have an amazing and little-known ability to see infrared light. They do this by means of their eponymous pits, which are essentially a second pair of eyes located in the loreal region of their face, between the normal (visible light or "lateral") eye and the nostril. 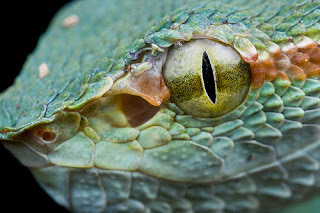 Some snakes, such as Emerald Tree Boas (Corallus caninus), have up to forty pits, meaning that in effect they have forty-two 'eyes': two lateral eyes and forty infrared eyes. Pit vipers have just two, but these organs are among the most exquisitely sensitive sensory organs in the animal kingdom. Other animals can also see wavelengths outside of the spectrum of light visible to humans. For example, bees and many birds can see ultraviolet wavelengths, and the complex eyes of mantis shrimp possess at least 16 different photoreceptor types, allowing them to see visible and ultraviolet light with fine sensitivity, as well as polarized light, thought to allows them to see their transparent prey. Because pit organs are found in snakes as distantly related as boas, pythons, and rattlesnakes, they must have evolved at least three times over the last 125 million years (boas and pythons, believe it or not, are fairly distant relatives). 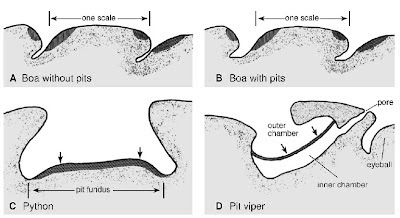 As you can see, the morphology of the pit organ is very different in these three snake lineages. In pit vipers, it is most sophisticated. The pit viper pit organ is made up of three parts: an inner and an outer chamber, separated by a thin membrane. This membrane functions as an "infrared retina", detecting infrared radiation that enters the inner chamber. 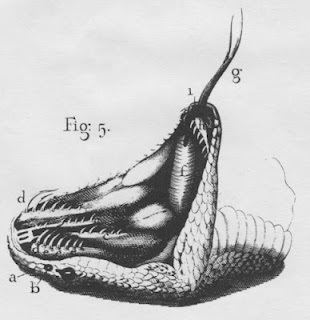 The inner chamber cannot be seen from outside of the snake's body, but it communicates with the exterior air via a pore located between the eye and the pit. Because the exterior opening of the outer chamber is smaller than the membrane, infrared light sources cast a shadow on the membrane, which are detected as an image by the nervous system. It works a lot like a pinhole camera. The information is processed by the nervous system separately from that gained using the lateral eyes, but all four (in the case of pit vipers) images are integrated in the brain to produce one single coherent image of the environment. It isn't so different from what your brain does when it integrates two slightly different images of the world, each collected by one of your eyes, to produce an integrated image with depth. The neurology of this process in infrared snakes is relatively well understood, although it is hard to imagine processing visual information from more than two sources. 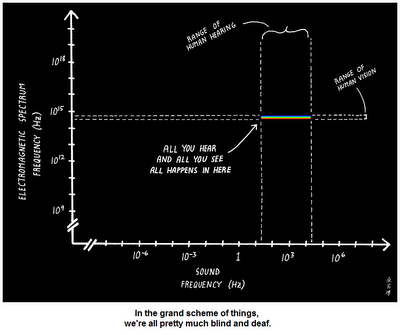 Rather than thinking of the pits as a "sixth sense", what they actually do is to improve the vision of the snake by making use of parts of the electromagnetic spectrum for which there are no color pigments. To envision this, imaging seeing heat (which is the most common source of infrared radiation) as an additional color. In fact, pit vipers can see differences in temperature in both directions - so an object that is colder than its surroundings also become more visible to the pit organ. It's like the image of a person holding a caterpillar to the left, except with real colors added also. Check out this site for more infrared images. 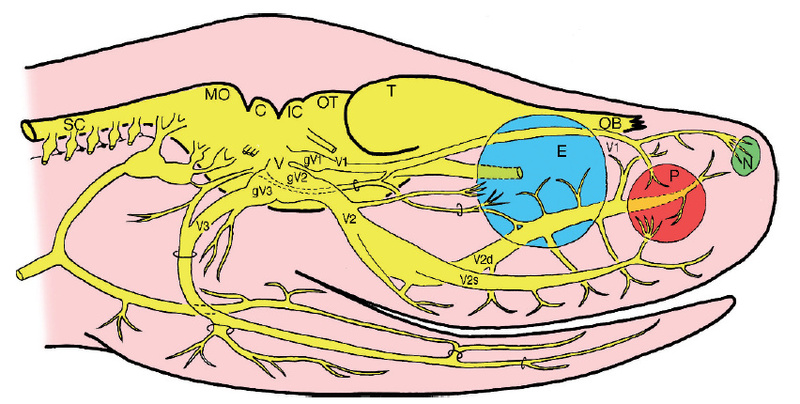 Innervaton of the crotaline pit organ. During the World Congress of Herpetology's venomous snake evolution session, Bruce Young of the University of Massachusetts at Lowell presented amazing new results revealing directional asymmetry of the thermal image. 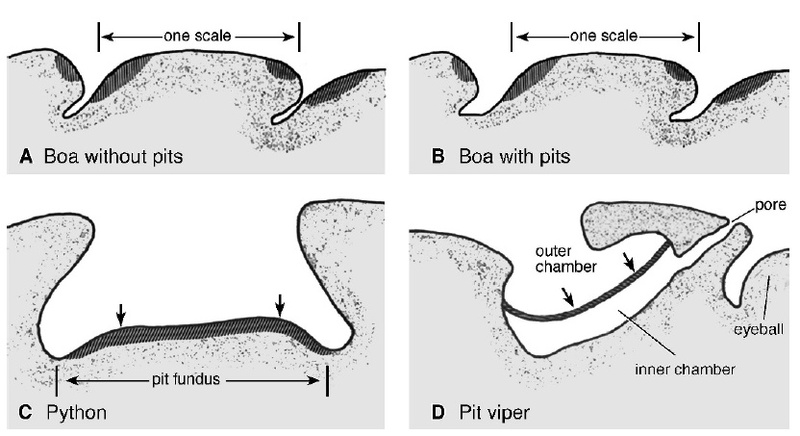 It was known that, depending on the habitat of the species, there was some difference in the configuration of the pit, but Young's recent work showed that the area of maximum focus (analogous to the fovea of the visible-spectrum eye) is above and behind the head in terrestrial species, and below and behind the head in arboreal species. Because the many uses of the pit organ include enabling snakes to better see predators and prey in great detail in the dark, including those that are partially concealed to the lateral eyes, it could be inferred that these differences in pit organ morphology are determined partially by ecology. 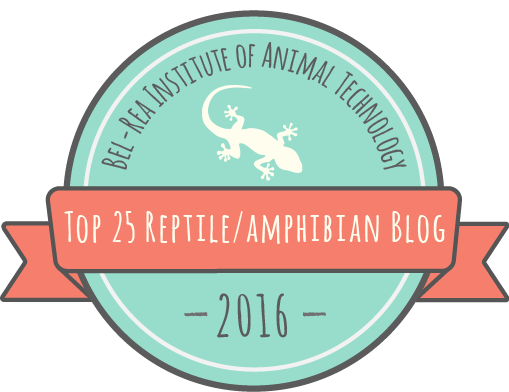 Much more work needs to be done on this fascinating system, especially cataloging the diversity of the pit organs of boas (53 species, not all of which have such organs), pythons (41 species), and other pit vipers (216 species). When I wrote the title for this post, I realized that it could also apply to two other groups of snakes that get along just fine without eyes. One is the blindsnakes, or scolecophidians, a primitive radiation of snakes about which many fascinating posts are forthcoming. Also worth mention is the population of Tiger Snakes (Notechis scutatus) on Carnac Island in Western Australia. Seabirds, especially Silver Gulls, peck out the eyes of these snakes while defending their nests from predation by the snakes. In a 1999 study published in the journal Behavioral Ecology and Sociobiology, Xavier Bonnet and colleagues found that tiger snakes that had lost their eyes suffered no loss of body condition, growth rate, mating opportunities, or survival. This is especially remarkable because it means these snakes are getting by using tactile and chemosensory information only, since elapids have no pit organ and cannot see infrared light. The late biologist and author extraordinaire Charles Wharton also documented eyeless Cottonmouths on Sea Horse Key in Florida in 1969, which, being vipers, could continue to rely on their pit organs, the function of which was poorly understood at the time. 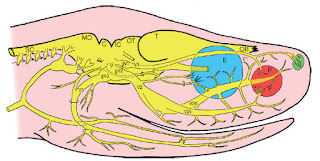 Older theories for the purpose of the pits included that they were ears, extra nostrils, organs of smell, secretory organs to wash the cornea, tactile sensors, part of a lateral line system such as that in fishes, or sensory organs of a completely unknown "sixth sense". It wasn't until 1935 that Margarete Ros first associated the pit organs of an African Rock Python with infrared radiation by observing differences in its attentiveness to warm objects before and after she occluded its pits with petrolatum jelly. 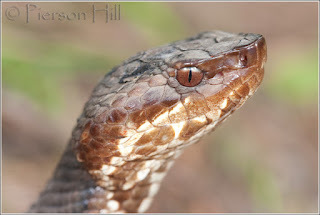 This was more than 250 years after Edward Tyson first mentioned snake pits at a scientific meeting of the Royal Society of London in 1683, during which he dissected a rattlesnake from Virginia that he called Vipera caudisona (almost certainly a Timber Rattlesnake, Crotalus horridus). Thanks to Kurt (orionmystery) for his photo of Tropidolaemus subannulatus, and to Pierson Hill for his photo of Agkistrodon piscivorus.